The global outlook for media tablet shipments will further evolve as vendor diversification occurs and emerging markets drive more growth. The worldwide tablet market grew 11.5 percent year-over-year in the third quarter of 2014 (3Q14) with shipments reaching 53.8 million units, according to the the latest market study by International Data Corporation (IDC). Partly driven by back-to-school promotions and U.S. appetite for connected tablets, the third quarter also saw shipments grow sequentially by 11.2 percent compared to 2Q14. "Not only is the U.S. market one of the largest for tablets, but third quarter results also indicate that this is where the growth is," said Jean Philippe Bouchard, research director at IDC. As an example of evolving market developments, IDC says that Verizon is continuing to sell connected tablets at a fast pace, a strategy that they believe other carriers will replicate in following quarters. Also, RCA entered the top 5 vendor list, impacting the entire U.S. market and worldwide ranking with one large deal linked to back-to-school and channel fill ahead of Black Friday. Those two elements resulted in the U.S. media tablet market growing at 18.5 pecent year-over-year compared to the worldwide market growing at 11.5% annually. Despite a continued shipment decline for its iPad product line, Apple maintained its lead in the worldwide tablet market, shipping 12.3 million units in the third quarter. Meanwhile, Samsung held its number two position on the market with 9.9 million units shipped, capturing an 18.3 percent market share in the third quarter. Asus regained its number three position with 3.5 million units and 6.5 percent share of the market. Lenovo fell back to the number 4 position with 3 million units. It is worth noting that Asus and Lenovo traded the positions they held in 2Q14. The top 5 was rounded out by RCA, which achieved its position by shipping 2.6 million units primarily in one country, the U.S. market. 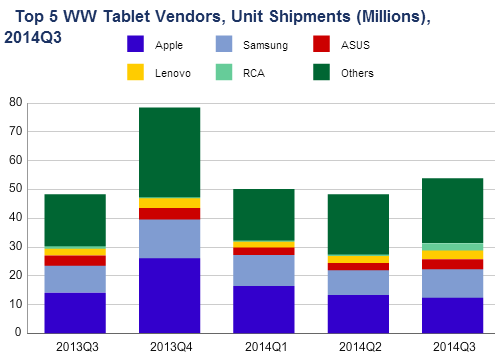 Furthermore, the worldwide market for media tablets continues to fragment, as share for the vendors outside the top 5 continued to outgrow, representing 41.8 percent of total shipments in 3Q14. Although the low-cost vendors are moving a lot of volume, the top vendors of high-cost devices, like Apple, continue to make the most profit. According to IDC's assessment, Apple believes that a sub-$100 tablet isn't sustainable, and it's the reason they aren't concerned with market share erosion. Of course, Apple probably thought that low-cost smartphones -- from vendors such as Xiaomi -- were not a threat to iPhone revenues, then later discovered that the savvy Chinese vendors could move up-market with more capable devices that were appealing to consumers -- because they offer better value for the money.